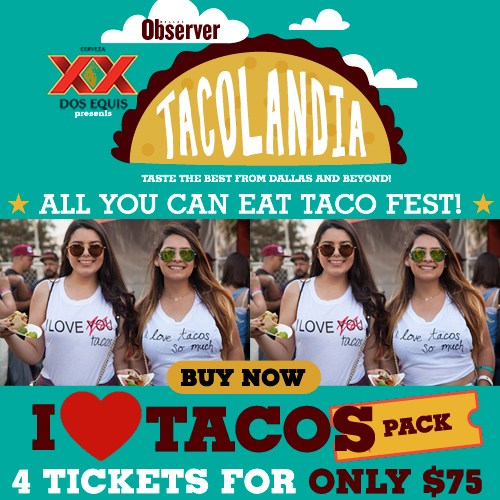 If you haven't already heard, the Dallas Observer is launching a new annual event called TACOLANDIA on October 17th. The festival will be featuring tacos, ranging from urban contemporary to authentic street style, complete with live music and cash bars with beer and cocktails. The best part is--the tacos are ALL YOU CAN EAT! Click here for a full list of participating restaurants. The taco fest will be held at Dallas City Hall Plaza (1500 Marilla St Dallas, TX 75201). Doors open at 3pm for VIP and 4pm for general admission. 1. Follow my instagram account @thefindingdallasblog. 2. Like the Tacolandia post. The winner will be announced September 27! DEAL ALERT! Dallas Observer is running a four pack deal, which gets you 4 general admission tickets for just $75! If you're already planning on attending the event with a group, this is a great way to save some extra cash (for more beer and cocktails). See below for more details on ticket pricing. VIP Ticket includes: Early Admission at 3pm for sampling before the general public and access to the VIP lounge and Private Bar with complimentary Beer and Cocktail Samples.